Ismail Ertug (MEP) is of Turkish descent and grew up Bavaria (Germany). After studying business management he worked as coordinator and social insurance expert in the marketing department of the German general health insurance (AOK) of Bavaria. Since 1999, Ertug is a member of the German social democratic party (SPD). After having worked as a member of the Amberg city council for five years, he now represents the Bavarian regions of Upper Palatinate and Lower Bavaria as a Member of European Parliament (MEP). 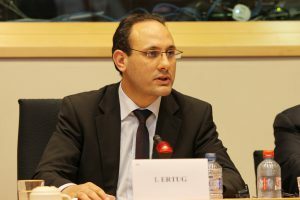 Ismail Ertug is member of the Committee on Transport and Tourism as well as of the Joint Parliamentary Committee EU-Turkey. As co-rapporteur of the TEN-T guidelines, he played a central role in the shaping of Europe’s future transport policy. Furthermore, he is a substitute member of the Committee of Agriculture and Rural Development as well as of the Delegation for relations with Israel. In his committee work, he defends the vision of a strong European transport network that allows for seamless connections across the entire single market. To him, this development should, however, contribute to the goals of the EU’s ambitious climate and environmental policies and go in pair with a modal shift towards more sustainable means of transport, such as rail, electric mobility and inland waterways.